When you are organizing your home for holiday guests, it is easy to forget about preparing. If you have overnight guests it is best to be prepared. Start with cleaning the bathrooms thoroughly. Remove toys and any other items that are not essential. It is a good idea to either leave a drawer empty or put a small plastic storage container in a cabinet designated for your guests. Make sure to have soap, shampoo and tooth paste on hard. Keep bathrooms stocked with toiletries and clean towels for the duration of your guests’ stay. How will I find more room for my guests? I’m already short on space? I can help. I am good at creating space in small areas and being creative with the space you have. I can help with organizing your home for holiday guests as well as creating usable space. Part of organizing your home for holiday guests is leaving a small space with a couple hangers available in the closet of the guest room. An empty drawer is always a nice gesture. Make sure to have clean sheets on the bed along with extra blankets and clean towels on the dresser. If you do not have climate-controlled rooms, you might want to consider having a fan and/or heater in the room. As people are traveling from different climates and different internal thermometers, it goes a long way to support them in this area. What if your guest room has become the craft room and is not set up for guests? Or worse, what if you don’t have a designated guest room? Have no fear. I can come to the rescue. I am efficient and effective in getting a room not only cleaned out and cleaned up, we can create an inviting atmosphere where your guests will feel comfortable. Of course we don’t want them to comfortable because after all, you do want them to go home at some point. Last but certainly not least, does your guest(s) have any special needs or dietary requirements? I have found that you can be better prepared by checking in with your guests before they arrive. You can use these tips for any occasion that involves planning a large meal and having a house full of company. 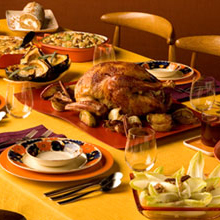 These tips are for the consideration of a holiday such as Thanksgiving Day or Christmas. Once you have your recipes set, use them to create a grocery list. It’s easiest to organize your shopping list the way the store is laid out: produce, meat, dairy, canned goods, grains, sweets and snacks. You many want to keep a list that is a flexible on going list as you remember that one item you forgot on the first trip. Most likely, you will be making more than one trip as someone eats the pie that was intended for main dessert or the favorite uncle just finished off the rum intended for the Hot Buttered Rum or it might just be a bottle of gravy you need because you realize you’re too tired to make any more food. Label your utensils. This is one of my favorite time savers. Match up each recipe to a serving dish and label it with a post-it note. This way you are prepared when someone asks how he or she can help. Simply ask them to gather the utensil designated for specific dishes. If you think you will have leftovers, plan ahead by asking guests/family members to bring a few of their own containers, rather than you using yours, which may not be returned. Personally, I have found people appreciate you asking them to bring containers because they know you are offering to send them home with leftovers. If you feel uncomfortable asking people to bring containers, you can purchase some one – time use foil containers. Inventory place settings, linens, room around the table, and chairs. Do you have enough for the amount of guests you’re expecting? If not, many people keep those easy to fold and easy to pack chairs that you may be able to borrow. Organizing your home for holiday guests and preparing the big day is only one part of the festivities- Enjoy the reason for the guests! Whether it is a day or days filled with traditions and activities, you are prepared for your guests, the meal and it’s time to breathe, relax, enjoy the company and smile knowing it will all be over soon. The is meant to be enjoyed, so, celebrate!